Once in America there was a major innovator and vocal builder of very fine acoustic guitars, and his name was Stuart Mossman. Big name artists such as John Denver, Eric Clapton, Albert Lee, Doc Watson, Hank Snow, Cat Stevens and Merle Travis. were all players of his instruments, and were they still in production today, there would be many many more. Growing up I was forever listening to my grandfather talk about acoustic instruments, and though I don't recall him ever owning a Mossman, I sure recall my grandfather talking about them. What I most specifically recall is the tale of the disastrous fire that burned all of Stuart Mossman's stock of high quality woods. Most particularly bad was the loss of a large stock of high grade Brazilian rosewood. Today Brazilian rosewood is sort of considered a holy grail type wood for guitars and guitar building, and one can easily spend a minor fortune on a guitar built with it's back and sides of that wood. A Beautiful Mossman Acoustic Dreadnought - Very Very Fine Guitar! 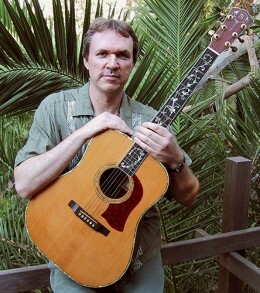 Mark O'Connor With His Mossman Golden Era Guitar! Starting in around 1961 Stuart Mossman was making guitars in his garage in Winfield, Kansas, and this is rather proper, you see, as Winfield is the home of the largest folk festival in the Americas, the Walnut Valley Music Festival, which everyone should see at least once in their lives, if interested in this sort of article. Stuart realized that the folk boom of the 1960s had brought in a huge market for the kind of acoustic guitars that companies like C.F. Martin & Co., Gibson Guitars, and Guild Guitars had been making for years, and his goal was simple - to out do them all and make the finest acoustic guitars imaginable. Of course the kind of acoustic guitars I'm talking about here are the steel string dreadnought guitars that persons such as Doc Watson were playing flatpicking style music.with, but the instruments are used in all manner of music under the Sun as well. Mossman took his first steel string flat top to Watson and asked him to give him brutal feedback, and he did, but when Mossman brought Doc a second guitar later, Watson told him it was "the second best guitar he'd ever played." 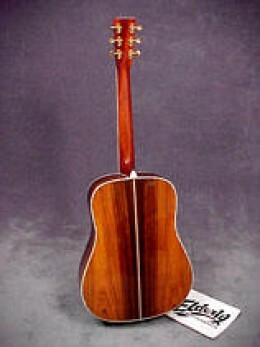 Stuart Mossman was adamant about some aspects of acoustic guitar building, and I agree with him in a very exact way - laminated woods used in the backs and sides of instruments are perfectly fine for the folks who can only afford a guitar with a solid top or sound board, but they should never be passed off as guitars made of all solid wood. An all solid wood constructed acoustic guitar is always a prize instrument, and should always be treated with great care, as an investment or an heirloom even. Here is what Stuart Mossman had to say about what he called "plywood instruments:"
"The vile abomination is currently being perpetrated on the unsuspecting guitar-playing public on a grand scale. There are so many of these plywood things on the market at this writing that there is a possibility you may not have even heard a real guitar. We at Mossman considered plywood briefly one day, and unanimously decided that plywood makes the best cement forms available. We do not know, nor will we ever, stoop to the level of plywood construction and we apologize for our contemporaries who have lowered the station of out craft by using laminated backs and sides." 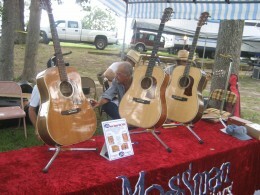 Though the fine guitars of Stuart Mossman did indeed compete or even out perform (this is truly subjective) his competitor's guitars, Mr. Mossman had never intended to compete with a big company like C.F.Martin & Co, rather, Mossman always wanted to inspect for himself every single instrument his company produced, and his company had grown quite a lot larger than just himself in his garage. Stuart Mossman was so very conscientious about his name and his instruments with his name on them, that he limited production just so that he could inspect every instrument prior to shipping.. In 1975 Stuart Mossman suffered a tremendous loss - his entire factory burned to the ground with a few guitars and all of his wood. No one was injured, and Mossman had luckily secured a large sum of money in the form of a loan prior to the fire, and the money was spent, obviously, on rebuilding his factory rather than what he'd borrowed it for. The loss of his large stock of Brazilian rosewood was not something the money could provide to replace, and so Stuart Mossman decided to start using the less expensive and easier to get East Indian rosewood. Maybe Stuart Mossman had been over stretched in his business endeavors, but the facts are he was sued for what appears to be a matter of neglect - he'd had a contract with another guitar company for production of instruments, and he produced the instruments just as he said he would - the problem was that the instruments were stored in a warehouse in Nevada without proper temperature and humidity controls, and so the finish on the instruments were all rather defiled by the elements and cracked. While the issue with the finish wouldn't make the instruments sound less beautiful, refinishing a beautiful acoustic guitar is the single most difficult thing imaginable for such an economic asset or investment. The situation was a disaster for all parties involved, and Mr. Mossman would soon retire. If you'll have a look at the picture above with Mark O'Connor and the Mossman Golden Era guitar you can see the vast intricate inlay of abalone shell, such shell is now known to be very deadly to a guitar producer to cut - and the breathing of the abalone dust is the exact issue, but perhaps that wasn't known during Mr. Stuart Mossman's days as a world famous acoustic guitar builder, but the facts are the same - his health was deteriorating rapidly from the exposure to chemicals and elements involved in the building of his guitars. Stuart Mossman died of heart failure at the young age of 56. He'd become known as a modern day Stradivari, and his instruments are among the most sought after musical instruments in the entire world. Now the Gibson J - 160E is an altogether historic guitar. 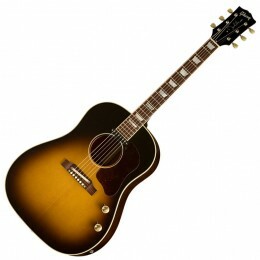 Clearly, the Gibson J - 160E is the first major acoustic/electric production instrument that was ever available in the United States and beyond. The Beatles had made great use of the Gibson model acoustic/electric, and though both John Lennon and George Harrison had both owned and played them - it's John Lennon who mostly became the big name associated with the instrument. Good sense says that these guitars are way over priced. Regardless of who you are, there is little doubt that if you are an adult and living in the Western World, then you most certainly know who John Lennon was. I think that it's safe enough to say that the majority of the persons who do know who John Lennon was at least are somewhat fond of maybe one song or another that he was a part of - even if you don't particularly like John Lennon, or the type of music that he'd created at all. Most people who know who John Lennon was, however, are clear fans on one level or another - anywhere from rabid to casual. In any case, no one can really doubt that John Lennon left his mark not just on America, but on the entire world. I, personally, definitely count myself as a fan of the music of both Lennon and McCartney, and John Lennon's solo work. I'm not the largest fan in the world, but then again there have been times where I just don't know what I would have been doing were I NOT enjoying the cleverness, the singing, and the experimental and sometimes simple music that the man had created. Though it's clear that John Lennon wasn't a fabulous guitarist - he certainly could play the guitar, and often did so while singing, or simply while backing up whichever Beatle was doing the singing for a particular tune. Often times John Lennon did this on one of his Gibson acoustic guitars, and now Gibson has honored his contribution not only to popular music, but to their own success with two different models of Gibson John Lennon Guitar. 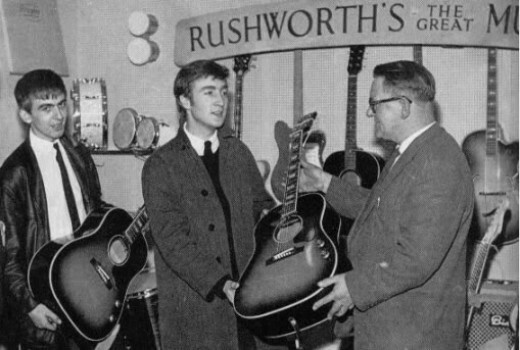 Both George Harrison and John Lennon Bought Gibson J 160E Acoustic/Electric Guitars. Now it's important to note here that the Gibson J - 160E existed before John Lennon had one, but because of Lennon's fame and use of the instrument, the Gibson J - 160E became so closely associated with not just John Lennon, but The Beatles as a group, that it's very fair that this guitar is now presented to the public with not one, not two, but three models with John Lennon's name on them. 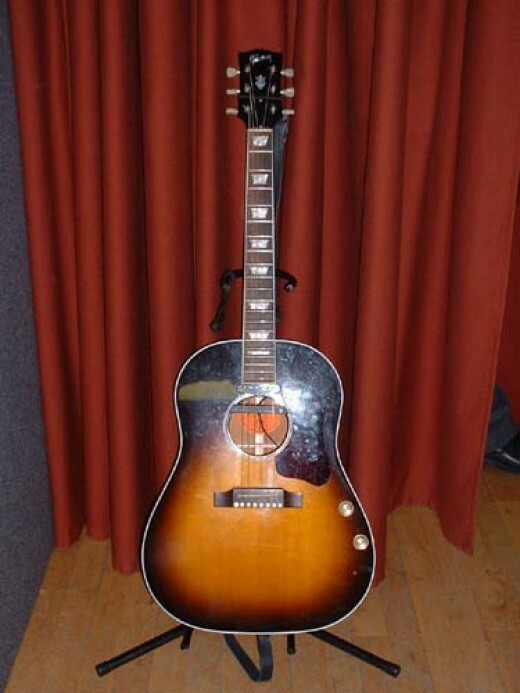 Originally, the Gibson J - 160E was not such a fine instrument, in fact, the guitar was mostly plywood, and was ladder braced instead of X braced, as nearly all fine acoustic guitars are. The J - 160E was only Gibson's second attempt at making an acoustic electric guitar, and it featured an uncovered P90 pickup, and the electronics that go along with it. One thing you can certainly be certain of - despite whatever the collectors inflated value is of an original Gibson J - 160E, the modern versions of those guitars are so vastly superior that the originals can't hold a candle to them so far as being a quality instrument is concerned. 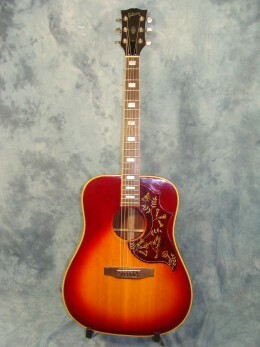 The Gibson J 160 IMAGINE or "Peace" Guitar. Now, I love the music of John Lennon - and I'm proud that Brian Epstein, the manager of The Beatles had decided to spend his own money to purchase these guitars for both John Lennon and for George Harrison - but I have to plainly state here - having John Lennon's name on a guitar in no way makes a guitar any better than another one. In fact - despite my appreciation for the Gibson Guitar company - it's my opinion that these guitars, as a player's instrument, are grossly over priced. When it's all said and done - these guitars might make great collectors guitars - but they have laminated spruce tops - and for five hundred bucks, I can find you a better brand new model guitar that would have a SOLID spruce top on it, which in and of itself ALWAYS makes a guitar a superior instrument to ANY guitar with a laminated top on it - despite the signature series, and the manufacturer. These newer Gibson models of the J - 160e with Lennon's name on them are surely better than the originals - but they still feature what Gibson is touting as something good - "traditional ladder bracing." It's just a plain fact that ladder bracing is far and away inferior a design for guitar tonality than is X bracing - which is what great acoustic guitars will always have with only a very few exceptions. Now, keep in mind here that the Gibson J - 160E was one of the very first acoustic/electric guitars ever in production by anyone and anywhere - but the first clue that anyone should have, besides the laminated top sound board, is the knobs for the electronics being on the top - that's a sure sign that this guitar isn't going to be much good for playing unless it's plugged in. Why? Because the very sound of an acoustic guitar comes from the vibrations of the top, and having knobs on it means that there are restrictions to the vibrations of the sound board. Most often when someone pays for a dreadnought acoustic/electric guitar - they intend to play it not just plugged in to an amp, but also wherever they may be. If you live in an apartment, it's quite natural that you can't play plugged in all the time - but this guitar would provide insufficient volume for playing unless it was plugged in, and this is because of the laminated top, the ladder bracing, and then the electronics placed into the top of the guitar. Modern designs for acoustic/electrics feature electronics in the less critical sides of the guitar. The seventieth anniversary model - the cheapest guitar of these three John Lennon J - 160e guitars is priced at $ 4, 728.00 dollars. These guitars are decent guitars - and the video at bottom shows how a new one today sounds pretty much exactly how Lennon and Harrison's guitars sounded on the early Beatle's recordings. It sounds fine - but these guitars are so over priced that I'd never in a million years recommend one to anyone. For the money that these things cost - there are hundreds of models of superior instruments that you could purchase anywhere from two to five of. The Martin D 50 Koa Deluxe! - Tree Of Life Abalone Inlay! I literally couldn't believe it when I saw the thing. I was perusing the booths at the Walnut Valley Festival, and the year was either 2000 or 2001, heck, maybe it was 1999 - I don't recall, and it's not important. The guitar was well protected from the crowds, and kept at the center of the booth. There were ten thousand dollar guitars that anyone could touch, pick up, and strum or otherwise play - but not this guitar. Yes, in case you were wondering - I DID get to play it, but I've no idea what I said, or if someone recognized me, or what. All I remember is that under close supervision and wary eyes I not only looked at the thing, I picked out some simple melody on one of these - probably something quick and easy like Soldier's Joy, or Big Mon. One thing important to realize here is that most any new Martin dreadnought is going to play the same, or have the same ease of play-ability. Paying fifty thousand dollars for a Martin D 50 Koa Deluxe doesn't get you a better performing guitar. What it gets you is the single most beautiful instrument in production, and a lifetime warranty to the original owner. A D 50 Koa Deluxe, By C.F. Martin & Co. The Martin D 50 Acoustic Guitar - Behold the Abalone Tree Of Life Inlay! This D 50 is an ULTRA Deluxe Featuring Brazilian Rosewood - The Deluxe, however, are Koa. The Martin D 50 Koa Deluxe - A Fifty Thousand Dollar Guitar. In case you missed what I'd stated above, the D 50 Koa Deluxe, by the legendary American guitar manufacturer, C.F. 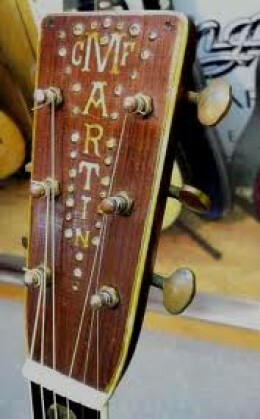 Martin & Co., out of Nazareth, Pennsylvania; is a guitar that costs fifty thousand dollars new. I don't know of a more expensive guitar in production anywhere. I also don't know of a more beautiful guitar. The pictures that I can provide here won't do the instrument justice. This is not just a guitar - this is a very fine work of art made by the finest craftsmen in the entire world. Yes, there does happen to be a Martin D 100 - but I've never seen one, or played one. I really do think that at some point so much abalone inlay has to cause sacrifices in the structural integrity, and the sound of an instrument. I'm just not sure - I'll just state here and now that the D 50 Ultra Deluxe would be the finest possible instrument that I could conceivably ever desire - despite knowing that even if I had that kind of money, I'd not buy one. Ain't no guitar worth fifty thousand dollars! There are many reasons why you are wrong. The guitar is priced rather well. In my hometown there are red neck bumpkins driving fifty thousand dollar pickups around for no reason whatsoever. They don't need that gigantic diesel truck, they only have it as a sort of ornament - and ornament that trashes the environment, and by degrees, leads to murders overseas by fascist corporations like Halliburton - so forth and so on. Those trucks are nothing but ornaments designed to give the appearance of worldly wisdom and success. But that fifty thousand dollar guitar can't take you anywhere! You couldn't be more wrong. Play a five hundred dollar guitar well enough, and it can indeed take you places. Some people actually do need their fifty thousand dollar diesel pick up - they haul around tractors and large trailers for their work - you could think of this guitar in that manner as well, an instrument of revenue generation. If you do not like to think of it like that, then you only need to look at this thing to realize that it's not just a fine musical instrument, but a work of beautiful high art. 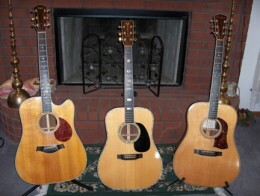 There are both a Martin D 50 Koa Deluxe, and a Martin D 50 Ultra Deluxe. The difference between the two masterwork guitars is that the Koa Deluxe is . . .made with Koa wood for it's back and sides, and the Ultra Deluxe is made with the even more expensive Brazilian Rosewood. Basically - the Ultra Deluxe is a Martin D 45 GE with tons more abalone inlay virtually all over the thing, and shimmering like diamonds. Either guitar is a masterwork of fine art that is also a musical instrument that has none but the other version to compare itself to. There is no more beautiful or wonderful acoustic guitar made anywhere on planet Earth. Though I've given the price above as in the general area of fifty thousand dollars, the facts are that if you have to ask, then you can't afford one. And because some of you may STILL think it insane that a musical instrument cost so much money - you clearly need to brush up on just what all is involved with a craftsman that spends so much time cutting so many tiny pieces of abalone shell for an instrument like this - and that person's health. Perhaps this is getting ridiculous, and I do think that that is the case. 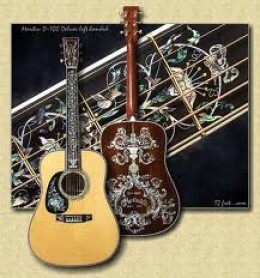 The Martin D 100 is surely a wonderful guitar, and for "just" $110,000.00 you may certainly have one. It's only that to me - an instrument like this isn't playable, it's too precious. Why bother? It's mostly Jewelry at this point. You are better off, in my opinion, with a Martin HD 28 VR, or even, could you afford it, the "mere" ten thousand dollar Martin HD 28 GE. I'm sorry, I'm only a fan of guitars that I can play without the constant fear of putting a ding in one of them. These things are more like sculpture , they are works of art. I do not know of a musician that owns and plays anything like this D 100. It's not going to happen. No one is going to tour with and perform well on a guitar like this. These more belong in a museum, in my opinion, but they certainly are beautiful to look at. That above all said, my opinions are just that. It could be all that abalone inlay literally improves the sound of an instrument when applied so liberally. I doubt it, but stranger things happen more frequently than we like to admit. The work done to create a guitar with such detailed and ubiquitous inlay is astounding, amazing, and surely took a huge amount of time for the precision pieces to be cut and fitted just so. I'd personally be scared to touch such a guitar. The threat of theft is not so much to worry about...so few such instruments exist it would be difficult for a thief to steal one and then sell it for anything. The worry would seemingly always be it getting scuffed up. 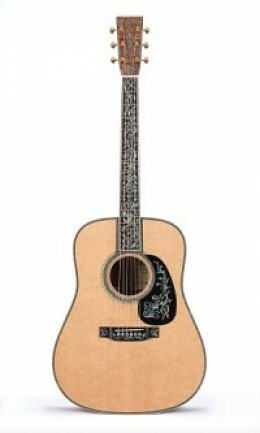 Myself, I'd never want a guitar more fancy than the Martin D-180. It's not a problem, I'll surely never be able to afford one of those either. The Gibson Guitar Company has always best competed with it's only real competitor, C.F. Martin & Company, by not competing directly. Martin might seem to set the rules so far as acoustic steel string guitars are concerned, but the people at Gibson Guitars never recognized those rules as the least bit valid, and they've done things exactly their own way. One of the prime examples of how Gibson had always done things it's own way has been with their Hummingbird Guitar. Now C.F. Martin & Co. had been producing dreadnought guitars since the 1930s, but during that time Gibson was focusing on other things such as mandolins and arch top guitars. 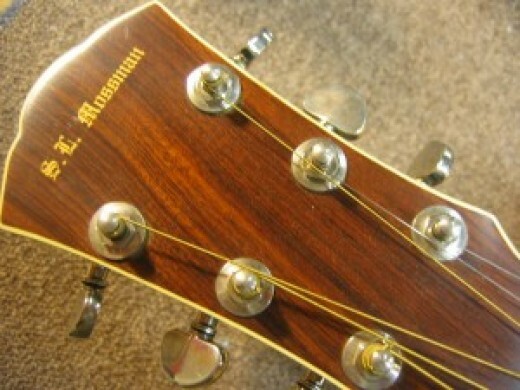 In 1960 Gibson introduced it's "slope shoulder" dreadnought known as the Hummingbird; and this dreadnought was very different from what Martin was offering in a large number of ways. 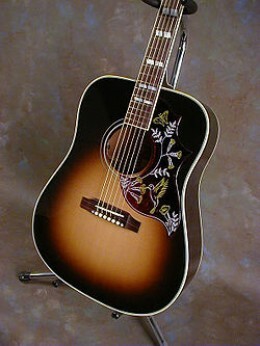 The Gibson Hummingbird Acoustic Guitar - Honey Finish. The Gibson Hummingbird Guitar - Cherry Finish. The Gibson Hummingbird - Mahogany Dreadnought. While C.F. Martin had been selling tons of dreadnought guitars that were universally loved by players, the Gibson Guitar Company jumped into the dreadnought market with it's beautiful Hummingbird guitar, and totally ignored the way Martin had been doing things. 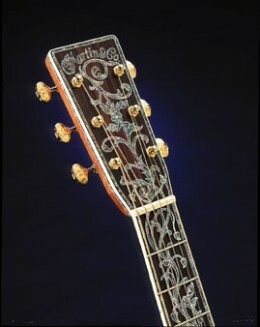 While Martin's beautiful D 45, and more widespread D 28 guitars were rosewood bodied instruments, Gibson's Hummingbird, which had the kind of appointments that Martin reserved for rosewood guitars, was instead a mahogany body instrument. Instead of competing directly with Martin with a dressed up rosewood body instrument, Gibson competed, if you will, with a completely different guitar, a mahogany body instrument with the beauty that Martin had reserved for rosewood guitars. It could be thought that this was brilliant, as any guitar builder would tell you that Brazilian rosewood is a very time consuming wood to mold into the body of a dreadnought guitar. Mahogany is much easier to work with than rosewood. Creating a mahogany body instrument with lots of inlay and upscale design, Gibson saved themselves some time and cost in the production of guitars that would compete with Martin's rosewood dreadnoughts in the upscale acoustic guitar market. Of course Martin had been making the dressed down and basic in appearance D 18 for thirty years - but the coup goes to Gibson for filling a niche for fancy mahogany instruments. The Gibson Hummingbird Vs. Martin Instruments. There are two things to consider if you are in the market for a Gibson Hummingbird and wish to compare that instrument to those offered by the closest competitor, C.F. Martin & Co. The first thing that you need to decide is exactly what it is that you like about the Gibson Hummingbird! Let's put it like this - the Hummingbird competes with the Martin D 18's in that both Hummingbirds and D 18 guitars are mahogany dreadnoughts. if you are shopping for a guitar based upon it's sound, then that is the thing to consider - do you like the sound of the D 18 best, or do you like the sound of the Gibson Hummingbird best? After deciding upon that you should then be thinking about which one of those instruments feels best in your hands. If PRICE is the main consideration - then hands down - I'm recommending the Martin D 18 VR to you over the Hummingbird, as I think the D 18 sound is preferable to that of the Hummingbird, and the Martin D 18 V is considerably less expensive. But if price isn't the factor most dominant in your decision making process, then the Martin guitar that you need to compare to the Gibson Hummingbird would be the more expensive Martin D 18 GE. If the LOOKS of the Gibson Hummingbird is what you are after - then mahogany and sound are not your priority, and the Martin guitars that compete most closely to the Gibson Hummingbird would be the LESS expensive Martin D 28 VR or even the Martin D 42. Please always keep in mind, and I can never stress any of this enough - no two guitars are ever the exact same - even if they are the same model made from the same trees and by the same person. That's just the way things are. Whether or not YOU can tell the differences yourself, or not, is not the issue - the facts are that differences exist, and someone else might have better hearing than you do. Advice: Always have SOMEONE ELSE - possibly a salesman or a friend that you brought guitar shopping with you play the instruments you are considering purchasing so that you can then hear those guitars with someone other than you playing them. THEN also play them yourself, and consider the differences in sound between what you hear when playing the guitar, and how it sounds when someone else plays the guitar. There is one other thing to consider - the Gibson Hummingbird comes as an acoustic/electric guitar with a pickup included. The only complaint I've read about this is that it's probably overly responsive on the bass end with it's L.R. Baggs pickup. If you are in the market for an acoustic electric - then this guitar features that and the Martin models that I mentioned do not come that way from the factory. You CAN get Martin acoustic electrics in those models, but it's not a standard feature as it is with the Gibson Hummingbird. If you are mostly an acoustic player - then the electric features will just be in your way, and you are paying for something that you do not need - keep that in mind. The Martin D 18 GE goes for around $ 3, 300.00 and features a solid Adirondack Red Spruce Top. The Martin D 42 is considerably more expensive at around five thousand dollars. 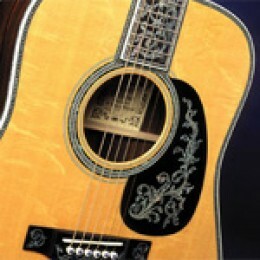 The Martin D-45 is the top of the line acoustic guitar produced by the legendary American company, C.F. Martin & Co. 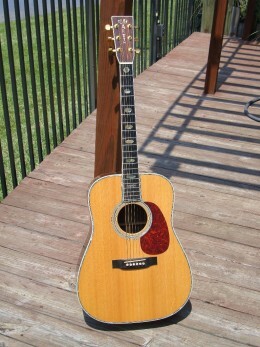 It is a similar guitar to their more widespread, affordable, and famous model, the D-28, in that it features a solid spruce soundboard, solid rosewood back and sides, and the high "X" bracing that is present on almost every single studio or professional quality guitar used for playing leads, or even rhythm. The Martin D 45 starts at a base price of $7,500.00, and then goes as high as the pocket is deep. The most famous, loved, and purchased acoustic guitars in the world are all Dreadnought, or "flat top" guitars-and they are always either guitars made by C.F. Martin & Co., the Gibson guitar company-or, they are copies of models that are made by Martin or Gibson. What distinguishes the Martin D-45 from other models in the Martin line, or other imitations of equal or greater value is the abalone inlay that is virtually everywhere on the Martin D-45. Especially noticeable is the abalone inlay in the solid ebony fingerboard. 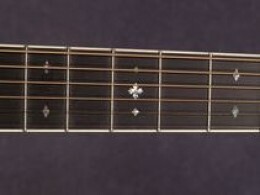 What you see, and what the inlay is used for is to demonstrate for the player, or the careful observer, the fret that the player is on with his left hand-this, assuming that the guitarist is right handed. Never fear, left handed pickers, or aspiring musicians-all Martin guitar models are available in left handed models, as well as the standard right handed model. Also noticeable is the abaloneinlay on the D-45 headstock, and a break from the traditional horizontal signature on the Martin Headstock, as the D-45 is abalone inlay, and vertical. I've imported two very fine pictures that show this beautiful feature. Maybe you noticed, and maybe you didn't-but the tuning keys on the D-45 are gold plated. We're talking about an instrument that goes to every extreme for beauty. Forty Five grand for a guitar might sound completely stupid to you-but it's not if you make your living using that guitar to do so. It's no different than that cowboy who bought a forty five thousand dollar pick up truck to haul his tractor and tools around with. Also, that particular D 45 had the most beautiful inlay pattern that I'd ever seen-it was various colors of green, and pearl white, and was of some kind of vine, and it "grew" from the sound hole up to the head stock. One more thing to consider when thinking about abalone inlay-it's very bad for the health of the Luthier building these guitars to breathe in the abalone dust that is created when the precision made pieces are cut for the guitar's inlay. I'm not sure that it's even worth it to do that sort of thing without all the right equipment. Think about that when you price a D 45, or other model of guitar featuring lots of abalone inlay. As I've stated above, the tradition with the Martin D 45 is that it is a guitar featuring the finest solid rosewood back and sides. This is still the case-but the Martin D 45 is also available with another, less often used tonewood, and that is Koa wood. Koa wood is becoming more and more popular as a tonewood for fine guitars, and it's a wood with some pretty interesting characteristics. I'll say that it would be impossible for you to go wrong with a koa wood guitar. . . but you just might not be getting exactly what you thought you wanted unless you've got a studied ear for guitars, and tonewoods. Let me explain: Koa wood's tonality varies more than mahogany or rosewood, depending on the density of the wood used; and koa wood density varies as well. Basically, it comes down to this: The more dense the koa wood - the more the guitar will sound like a rosewood guitar. The less denser specimens of koa wood make for a guitar that sounds more like a mahogany guitar. Prices start out for this beautiful guitar at seven thousand, five hundred dollars. The base model comes with a solid Sitka spruce soundboard, high X bracing, and solid East Indian rosewood back and sides. 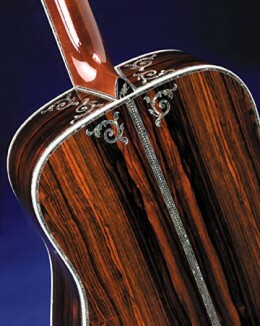 The base model has over 900 pieces of abalone inlay found virtually all over the instrument. The deluxe case that this guitar comes in itself retails out at $190.00. The next level up on the Martin D 45 ladder is the Marquis model, which features some "Golden Era" specifications not found on the standard model, such as the solid Adirondack spruce top, and "snowflake" style inlay. 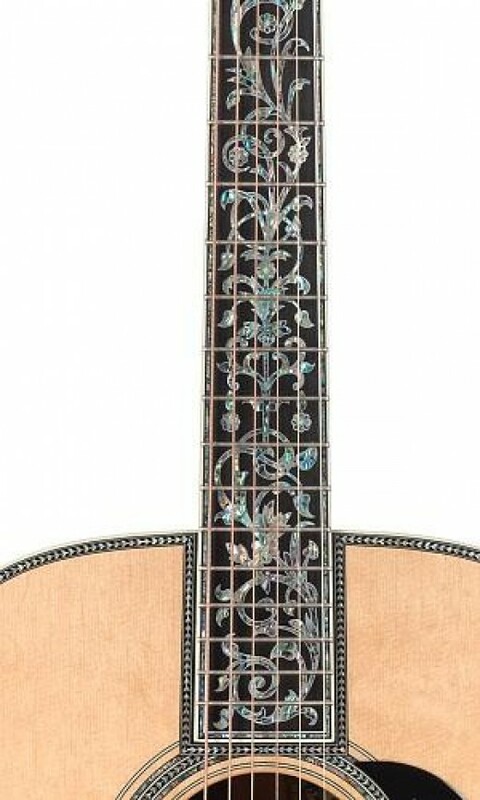 This guitar sells for a $10,000.00 The "snowflake" abalone inlay pattern essentially gives you a lot LESS abalone inlay. The pride and joy of the musician who owns THIS model of D 45 is the Adirondack "red" spruce top, Adirondack spruce is the premium, and often preferred soundboard for pickers, or soloist. This guitar is geared less towards beauty, and more towards sound. The D 45 By C.F. Martin & Co. In conclusion, I'd like for you to understand that the Martin D 45 is a guitar built for beauty, and all Martin guitars built with solid tonewoods are built for premium sound, and are intended for a professional, or a serious enthusiast. Having said that, it's important to understand also that a guitar enthusiast is often mostly interested in the guitar's tone and playability. Because no two guitars, even guitars made from the same woods from the same trees by the same luthier will be "equal," a standard model Martin D 45 might very well be preferable to one musician over a Golden Era model-based on sound. The opposite might be true for someone else. The Golden Era model, however, will always retain a higher value both new, and used to most any and every consumer. I hope that this has been interesting and useful to someone-and I haven't touched on some of the finer, less known and considered specifications for these types of guitars, but should you stay tuned-these subjects will also be addressed. As always, I'm happy to answer any questions that you might have. Till then, play your guitar!